The creativity of the Filipino has always been recognized worldwide. But such creativity is limited to a few types such as the performing arts and even sporadic forays in such shows as American Idol. But a wide range of Filipino creativity has yet to make a breakthrough in the international arena. The Creative Industry Sector in the Philippines is a wide and varied sector since creativity takes many forms. It is not only in music or dance but also include design, film, game development, architecture, literature, all the way to software development. During the Arangkada Philippines 2018 Fora, one of the panelists explained that aside from having advanced technology in creating, the Filipino tends to create not for a global audience unlike the South Koreans who have gained success not only I the performing arts but from their designs in cars to smartphones. 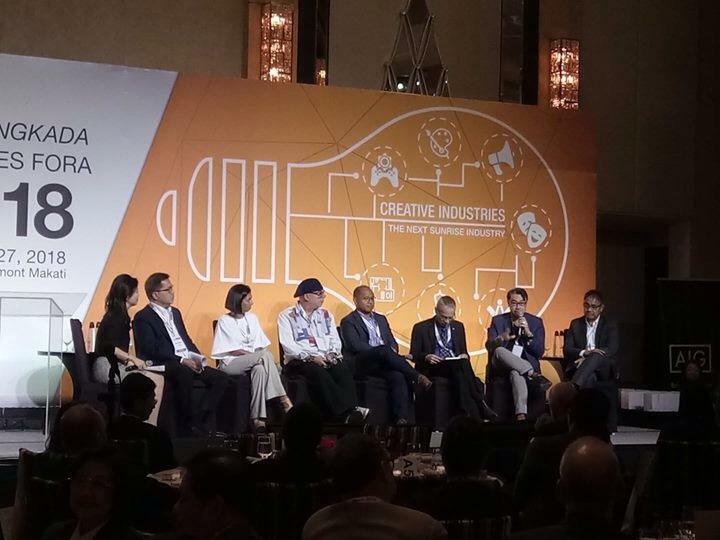 Another point noted that there exist no creative industry eco-system in the unlike its ASEAN neighbors such as Singapore, Malaysia, and Indonesia. These countries have invested I their creative industries and that is why the Philippines is lagging in the trillion dollars creative industry worldwide. It was not the lack of talent stated Prof. Gaston Ortigas but the lack of investment on harnessing Filipino creative talent wherein the country has a large talent pool. Also, as cited by Mr. Hok Lee of the Korean Chamber of Commerce in the Philippines, the government has to intervene and support the export of Filipino creativity such as what the Korean government has done even with the development of its K-Pop talents. It was also noted that in sub-sectors such as the game development industry, government support via stable ICT infrastructure and the introduction of game development in the academe must also be given importance. The Information and Communications Technology curriculum and methodology must also be reformed. In 1 industry report, 60% of IT graduates are classified as “un-hirable” due to the lack of programming and coding skills. Also, the stigma that “artists” are most likely to starve must be erased from our culture. This was the observation of Prof. Gaston Ortigas. All-in-all, the Philippine Creative Industry Sector needs the cooperation of all Philippine economy stakeholders as well as the academe I nurturing and developing it to be competitive worldwide.